After almost twenty years of doing absolutely nothing and getting paid handsomely for it since quitting my post office job in 1993, I have taken a position with Huntington Press, or more specifically, with Vegas Lit, the new Huntington Press fiction line that will be launched on September 30. I am the Executive Editor, Managing Editor, Senior Editor, Editor-in-Chief, Editorial Assistant, and Assistant to the Editorial Assistant for the Vegas Lit imprint. Which is to say, I’m the only one working there. I would have included Office Manager among my many titles, except I don’t have an office. I’m working out of my garage. In any case, the first novel to be published by Vegas Lit will be one that was written by… excuse me while I find my notes in all this clutter on my desk—oh yes… Here it is: It’s Risk of Ruin, my own novel! Imagine that! But, what can I say? It just happens to be one of the most compelling manuscripts that’s ever been submitted to Vegas Lit in our long and esteemed history. So, dust off those Pulitzer Prize nominations and Nobel Prize nominations and Book-of-the-Month Club Selections and anything else that needs dusting off, like maybe three measly bucks so you can purchase the ebook edition, which will be available soon, I hope, unless Huntington Press fires me for deciding to lead off with great literature, instead of some vampire/zombie drivel that might actually sell a few books. All Vegas Lit titles will be published in ebook formats (at $2.99 each) and in print editions (at $11.99 each). We’ll be using local Las Vegas artists for cover art. Now available: Risk of Ruin by Arnold Snyder. Not wanting to toot my own horn, I asked Richard Munchkin, author of Gambling Wizards, to write a few words about this book. He says: “Bart Black is a blackjack-playing biker tattoo artist that becomes obsessed with a 16-year-old stripper who thinks she’s God. Join them on the back of Bart’s Harley for a wild hallucinatory ride: Reno, Area 51, Vegas, strippers on parade. What more can you ask?” The cover art is by Joseph Watson. For more information about Risk of Ruin see this excerpt and GodsGuilty.com. November 30, 2012: Becoming Bobby by Michael Konik, former gambling columnist for Cigar Aficionado and author of seven nonfiction titles, including The Man with the $100,000 Breasts and Reefer Gladness. This is Konik’s first novel, the story of a middle-aged, middle-class, American Humbert Humbert who becomes one of the highest of casino high rollers in this mordantly funny satire on living the American dream. I love this book–for one thing, it’s one of the funniest books I’ve ever read. For another thing, like Chad Kultgen’s Average American Male, it gets to the heart of the greatly-damaged 21st-century American male psyche, and eviscerates the Vegas high roller within us all. The cover art is by Joseph Watson. If you’ve got that manuscript, send a query letter (no attachments) to: editor/at/VegasLit/daught/com. Do the books have to be set in Vegas? What kind of books are you looking for other than, great? You may have a small edge if the novel includes gambling, casinos, or Las Vegas, or the Southwest, but I’m really just looking for manuscripts that I feel deserve to be published. If you read around this blog, you should get a feeling for the kinds of books I like (though this blog is pretty new and my taste is much wider than what you’ve seen so far). If you’ve written a great book about a little girl and her pet pony, give it a shot. Convince me you’re brilliant. 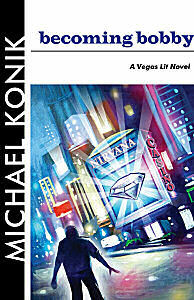 My crime thriller trilogy Future Imperfect is set in 2032 Las Vegas. Available now in ebook & print version of Crucifying Angel, Book One, from my publisher scheduled for early 2013.